Keep screen on – will prevent your Android device to turn the screen off. Use ‘root’ for USB access – if you enable this option and your Android device is ‘rooted’ then the application will try to use ‘root’ and libusb for communication with the USB connected DSLR camera. Show capture history after capture – the application keeps track of the last 50 captures that was made while the DSLR camera is connected to application. Enabling this setting will show the capture history after every capture. Allow connection sharing – by enabling this setting DSLR cameras connected to the application will be available over network to another qDslrDashboard instance running on another PC or Android device. Local image folder – this is the folder where qDslrDashboard will save the images downloaded from your connected DSLR camera. Local image file name prefix – if a DSLR camera does not provide a file name while downloading an image this prefix will be used to generate the file. The file name will be in format <prefix><counter_value> . Clear local thumbs – pressing this button will delete all the local image thumbs that can be found in the .thumbs/localthumbs folder under the DslrDashboard folder. qDslrDashboard stores the thumbs for local image files located in the DslrDashboard local image file folder in the folder .thumbs/localthumbs for faster access. qDslrDashboard will check and recreate the local image thumbs for images that are located in the DslrDashboard local image folder. 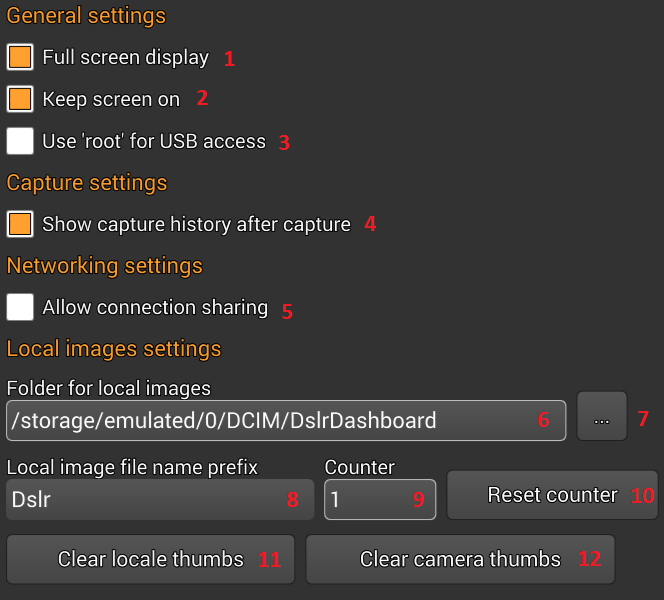 Clear camera thumbs – pressing this button will delete all the image thumbs that can be found in the .thumbs/sdcardthumbs folder under the DslrDashboard folder. qDslrDashboard stores the image thumbs for images located on DSLR camera SD card in the .thumbs/sdcardthumbs folder for faster access. qDslrDashboard will download the image thumb from the connected DSLR camera if it can’t find a thumb in the .thumbs/sdcardthumbs folder.